Since migration in Greece reached a peak more and more people have become sensitized over the issue. At first, by sending clothes and food supplies and later on by actively undertaking different tasks in the large refugee camp in Eidomeni and other reception camps in Northern Greece. 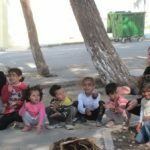 Now, in most of the camps there is a big network of NGOs and solidarity groups such as PRAKSIS (Programs of Development, Social Support and Medical Cooperation), R.S.M.T (Refugee Solidarity Movement Thessaloniki), UNHCR, Doctors without Borders and Oikopolis which coordinate all volunteer activities. These include cooking and food distribution, distribution of clothes and first need equipment, medical care and legal counseling. I wouldn’t call myself an activist. It takes great physical and mental effort to be a real activist. I would rather say I am an educator who is sensitive to global issues and is ready to support and provide help when it is needed. My initial motive when I first visited Eidomeni around Christmas was to see the situation myself. I went there with a volunteer team from Oikopolis, one of the most active solidarity groups in the camp. The borders were open then and Syrian, Afghan and Iraqi asylum seekers were free to cross after they had their papers checked by the police. NGOs were mostly in charge of food distribution to make sure refugees will leave Greece and continue their long journey well equipped. After the borders closed people were stuck in Eidomeni for months. Everyday there were protests for the opening of the border, hunger strikes and clashes between the refugees and the police. Tear gas, chaos, violence led to an explosive situation. New immediate needs were created as refugees had nowhere to go but the camp. Hundreds of tents were set up and some basic infrastructure (hygiene and medical care services) was constructed. Since refugees would have to permanently stay in the camp for an unknown period of time there was an increasing need for volunteers. I felt compelled to offer my services once again. In my second visit, Eidomeni already looked like town. It was tough and it still is but it seems that with the help of volunteers, refugees are getting used to their everyday life. All volunteers I met in the camp, whether long term or short term, are people who are committed to what they offer. They want to provide refugees some stability and joy during a difficult transition period in their lives. They believe that despite the bad living conditions, life in the camp doesn’t have to be nightmarish. To this end, they have taken initiatives to reduce tension and anxiety among refugees and create an environment where they can feel safe and secure. There is now a child-friendly space where, among others, drawing workshops are organized for children. Unaccompanied children are also offered psychological support by professionals to overcome traumas. In the cultural center of Eidomeni, volunteers regularly organize recreational activities, mainly based on singing and dancing. Other reception centers run similar activities. 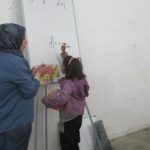 In Diavata reception camp, there is a group of graduate and postgraduate students (some of them newly qualified teachers) who visit the camp daily to engage refugee children creatively through team games, circle time, arts and crafting. I couldn’t resist but join them in one of the activities. I wanted to share their joy. Children, who would otherwise be wandering around the camp without any supervision, now had a reason to be excited. Their everyday routine was not meaningless anymore. I could see that developing a sense of belonging to a community, they felt less intimidated. Of course, language is still a barrier for the vast majority of refugees. Very few of them speak any language other than Arabic. While volunteering in the food distribution point in Eidomeni, I’ve experienced the frustration of so many refugees who couldn’t communicate their needs and feelings just because they didn’t have the means to. As a result, there have been a number of misunderstandings, quarrels between refugees and volunteers, even fights. Gesturing and nodding cannot make up for communication breakdowns. Learning the language of the host country will certainly help refugees integrate and function in a society which would otherwise be hostile. English is also a survival language for them. 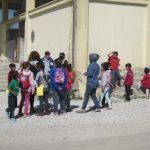 Recently, NGOs and solidarity movements have responded to this need and have informally set up schools to teach refugees some basic English and Greek both in Eidomeni and Diavata camps. 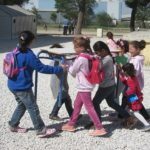 Teaching English and Greek in a refugee camp does not require any specific skills. In hard times it’s not qualifications that matter but the desire to help and to offer one’s service. When I first learnt about the school, I decided I wanted to get involved in this. 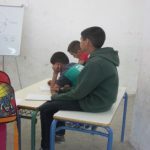 I visited Diavata camp where volunteers run two different schools, one for children and one for adults. 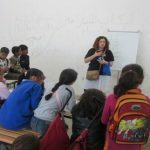 English is taught by Arabic speaking volunteers or English speaking refugees who stay at the camp. Lessons take place in an empty space inside an abandoned building. No actual classroom setting, no equipment, just a small portable whiteboard and a few desks and chairs. In my first time in Diavata camp, I was present at the setting up of the “classroom” for the English lesson. The students, mostly children between 7-14, were in charge themselves. They carried desks and chairs into the building and put them in a row. Some of them were carrying schoolbags others had a notebook and a pencil in hand. I couldn’t believe the amount of joy and excitement this class generated. It seems that the class has brought a ray of hope to all involved. Volunteer teachers told me that they have started with little supplies but full of good intentions. They have launched a crowd funding campaign to raise money for school materials. I have already donated some spare notebooks, dictionaries and English grammar books myself. 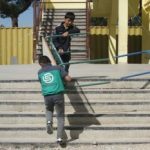 Even though I have no clue about Greek lessons running in the camp, I noticed that refugee children are dealing equally well with both Greek and English. I remember when I first entered the school building, I was approached by an 8 year old Syrian girl who was trying to impress me counting up to twenty both in English and Greek. I was so touched. I even felt proud as for a moment it reminded me of the pride I take whenever my own students in the school I work show off what they have learnt. I looked around and wondered “How is it possible to have such a passion for knowledge while having to live in such a place?”. I kept looking at the children’s faces. I saw happiness and satisfaction. I almost forgot I was there to help people recover from their miseries. It seems that children no matter where they are, what they have witnessed or went through never lose their innocence and enthusiasm for new things. Their enthusiasm is contagious. It really is. It gives us, volunteers, a reason to keep struggling to build a safe environment for them. I have now joined the volunteer teacher team and try to support them in their efforts. Last week, I brought fairytales to read to the students after an English lesson. Even though English is still too complicated for the younger ones who have just learnt the alphabet letters, they respond well. Children have an amazing ability to pick up new language once exposed to it. After all, fairytales are fun especially when children are in a friendly inviting environment. This made me think that if children have an advantage over adults regarding language learning, we, as teachers, need to make the most of it. 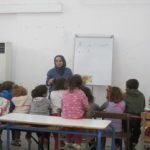 I am very glad that other ELT colleagues have shared my concern, supported the initiative and are now running a project on teaching English to refugees. I wish more and more people get involved in this not only through crowd funding for the setting up of schools but actively joining this enthusiastic team of teachers to help refugees start a new life. Niovi Chatzinikolaou holds a BA in English Language and Literature from the Aristotle University of Thessaloniki, an MA TEFL from the University of Essex and a CELTA. For the last two years she has been teaching English in a private language school in Greece. She has also worked in English language summer camps. She is an active member of the TESOL Greece community and passionate about professional development. She speaks Spanish and German. She has volunteered for environmental causes for many years and she is now doing a MSc in Environmental Education in the Aristotle University of Thessaloniki. Very inspiring Niovi. It’s clear that what you are doing is giving those you teach some dignity too. It reminds us of the power of education. I wish you all the best.